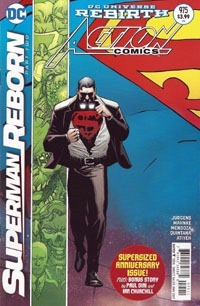 While this issue’s cover did not grab me the way Superman #18’s cover did last week, it had its own way to stand out, in the form of the large S-shield on blue as the main background, and the shadowed Clark Kent tugging his shirt open to reveal the classic "bleeding-S" first used with 1992’s Doomsday! / The Death of Superman. I didn’t even consciously notice until later that the title’s logo–Action Comics–was done as a white outline, virtually disappearing with the rest of the cover standing as itself. The green bar on the left seemed a contrast to last week’s issue…but when I held the issues together, they fit together perfectly, pretty much as I’d expected (except I’d figured chapters 1 & 2 would be top-left/top-right with chapters 3 & 4 as bottom-left/bottom right, respectively rather than top-left/bottom-left so far). And these are–to best of my knowledge–STANDARD covers, the NON-variant covers, just being covers in and of themselves, no fancy tricks, no bags or accessories or foil or die-cut cardstock or 3-D lenticular/hologram stuff. 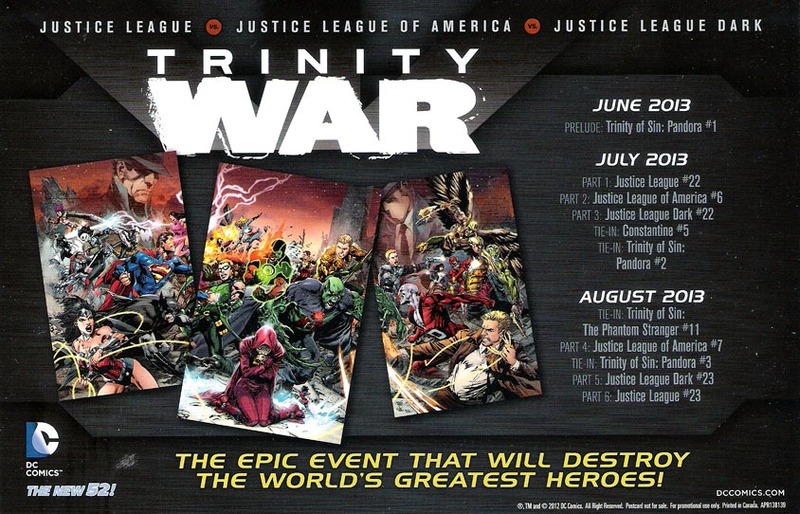 Just a 38-story-page issue (one 20-page lead story and an 18-page companion piece) for only $1 more…making an EXTRA-SIZED anniversary issue cost…the same as a 20-page Marvel comic. 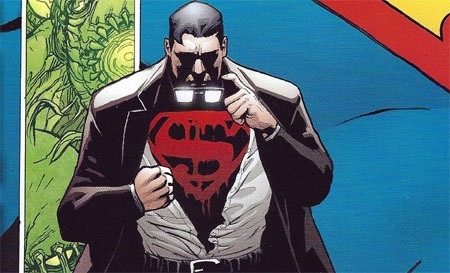 Since virtually the beginning of Rebirth, the "human Clark Kent" has been a mystery. Things took a turn toward the creepy with the character lately as it became particularly obvious there was something "off" about the character, beyond our not knowing him any better than characters in the comics. 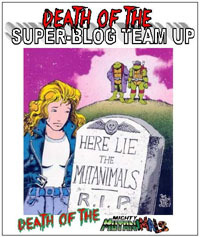 The "slow burn" of that "subplot"–a through line in the books for most of a year–finally comes out in this issue as we learn the identity of the mysterious doppelganger. After Jon disappeared, Superman and Lois go immediately to "the Other Clark"’s apartment seeking their son. 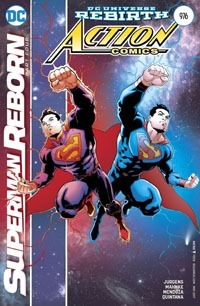 Jon’s nowhere to be found…but the couple meet Clark and "our" Clark finally realizes who they’re facing. Though the figure is revealed…we get a few pages of shape-shifting with Superman glimpsing a number of prominent figures in his rogues gallery. Ultimately, a new threat arises, as we’re left on a cliffhanger for the next chapter exactly at the staples of the issue. I generally–and this time is not an exception–find it interesting when I find myself guilty of something a main character is accused of. In this case, I did not see this coming, though in retrospect, I should have. I think I "got" it right before the first of the splash pages featuring other villains, as things all clicked into place, making sense across the months in a believable way that I really dig…though the particulars still have some shaking out to be done. Mr. Mxyzptlk is our "Mystery Clark," having used his powers on HIMSELF, even, to complete the act–forgetting himself who he was and truly believing himself to be the genuine article. However, the imp is highly cheesed-off at being "forgotten" by Superman…an accusation I realized immediately I’d been guilty of myself…being unable to remember the last time I read a "new" story with the character! As punishment, Mxy will have Lois and Clark forget Jon even exists, though they won’t forget Mxy! Art-wise, I have mixed feelings on this first half of the issue. The visuals are quite good, and I mostly like ’em…there’s just something slightly off, that I’m apparently not used to…or not consciously, anyway. Mahnke‘s style is very good, but some of the faces–particularly the villain splash-pages–seemed a bit off, and it’s definitely unsettling to see Mxy in this way…reminding me slightly of the character’s tone in Whatever Happened to the Man of Tomorrow? without going quite that "sharp" and such. Story-wise, this seemed way too short a segment, with a good quarter of the issue being a villains-show-off (#975, anniversary issue, lets see a bunch of best-known Superman villains!) and not really much plot advancement to the Reborn story other than actually pulling off "the mask" so we could see who’d be the antagonist of the rest of the story, or so it seems. This is made up for by the Second Feature. Mr. Mxyzptlk has Jon Kent as his prisoner. We learn that Clark had told Jon stories of him when he was younger…though Mxy was simply "The Man in the Purple Hat" or to Jon, "Ruppletat." 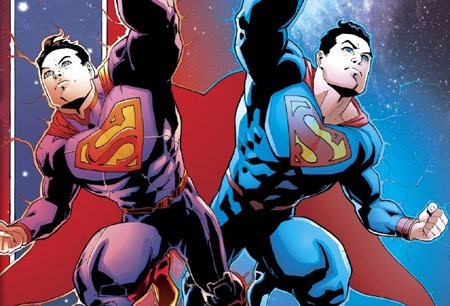 Mxy reveals what he’s been up to for years–having been captured, held, and tortured by Mr. Oz, keeping him "off the table" while Oz’s plan for Superman has unfurled. Mxy had contented himself initially with the sincere hope that Superman would be along to save him within days (when Mxy wouldn’t show up at Day 90, surely Supes would check into why the imp hadn’t reappeared for the traditional every-90-days challenge!) Time passed and no one ever showed up to rescue him…so he had to escape on his own. 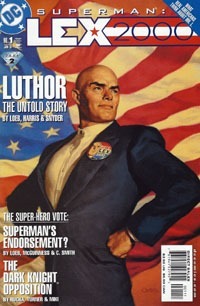 Once he did, he saw a way to kill two birds with one stone: hide himself from Mr. Oz while helping his buddy Superman in the process, but putting the "Secret Identity" back in the bag. Mxy had to mind-wipe himself to complete this…and was none too happy when he redisovered his own secret…and now he’ll have his revenge utilizing Jon to get at Clark. 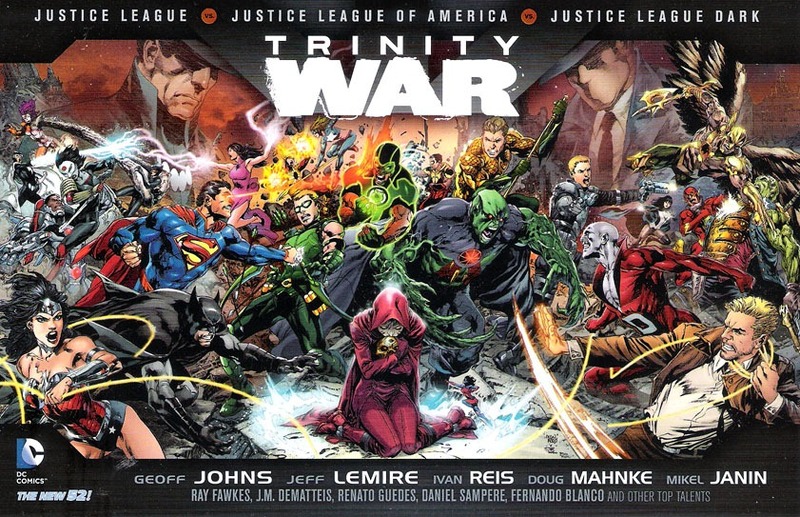 I’m pretty sure it’s Churchill‘s art in this segment that put Mahnke‘s art in the first to seeming less thrilling to me. Churchill’s work here is great, with one of the best renditions of Jon Kent I can think of, and a sort of detail to Mr. Mxyzptlk that’s going to make other artists’ take look weak by comparison. Story-wise, I love that Dini gives us a clear, reasonable explanation for Mxy’s actions and motivation, and this single story’s impact drives back to last May and retroactively adds to those previous issues! This gives us a spotlight on both Jon and moreso, Mr. Mxyzptlk and bridges the gap between whatever his last appearance was and now, while setting him up as an extra-scary antagonist. This is a strong complementary piece to the main story…expanding and contextualizing without having to me its own separate ISSUE or chapter, which will presumably make the "core" chapters that much tighter a story in the end. We even get some breaking of the "fourth wall" without breaking continuity…and actually suggesting the rich DC multiverse all the more in a way that totally fits Mxy’s character, and allows readers a smile and "a-ha!" in recognizing other ways in which Mxy has appeared over the years. This is an "anniversary" issue…that is, attention is on the issue’s NUMBER: #975. The round 75, marking off 25 issues since the 950th (which was still part of the New 52 Action Comics #s 0-52 numbering hiccup)…and 25 to go until the big #1000 mark next year. While a new reader could certainly wade in and likely follow the story a bit…this issue as a whole is like a gift to the readers who’ve been following stuff for awhile, and is certainly a huge treat for me, paying off some ten months of stuff and doing so not only to mere satisfaction but in a way that leaves me eager to continue with the story! It makes sense to me, is believable within my conscious following of stuff, and does not let me down. The "villain pages" in the first story are a bit disappointing as those pages go way too quickly for me just trying to read the story…but they’re a sort of "special" thing for an anniversary issue, and aren’t the cop-out they’d have been if this was not an extra-sized issue. Action Comics #975 is well worth its price simply for number of story pages, and is a great payoff to months of story-build while keeping things going for whatever’s coming as Superman: Reborn continues.